The final battle between the Pridelands and the Outlands is upon us, and both sides are ready for war. Mothers hide their cubs and fathers prepare their goodbyes, for no one knows who will survive the onslaught. But Zira's last stand will not be the final battle that everyone is anticipating. The final son of the tyrant Scar remains, plotting in the shadows with his partner and future queen. The hyenas have started to return, vowing their allegiance to Sibu. Kings will fall and new blood will rise. Destruction is brewing... Are you ready for the fight? Will you take the side of darkness and follow Sibu in his quest for revenge? Or will you take the path of justice and fight for what's right? Will your character be the one to die valiantly or will they be the one to save the day? 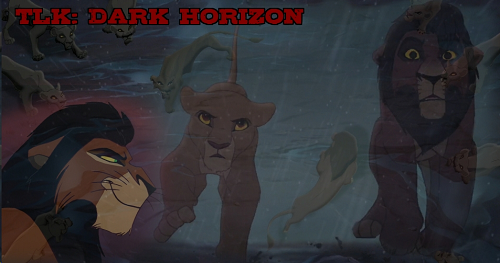 Dark Horizon is an alternate universe TLK roleplay that expands upon the story of the Pridelands and other territories, such as the lush jungle of the Lowlands or the sandy, dry Desertlands. With a word count of 250, it caters to not just one but all roleplayers with many opportunities to create your own story inside or outside of the Pridelands we all loved, with canons available and original characters encouraged. Our community is growing, and we would love to have you as our storyline progresses beyond the script of Simba's Pride! Is the canon character you want taken or deceased? Are you looking for a simpler way to begin at Dark Horizon? There are lots of adoptable characters available in our Want Ads!